Sanofi responsible procurement team is committed to Corporate Social Responsibility (CSR) in Sanofi responsible procurement activities and selects goods and services that are produced and provided in compliance with the highest environmental, social and ethical standards. We are working closely with our suppliers to promote corporate social responsibility related to the sourcing and use of materials and services. 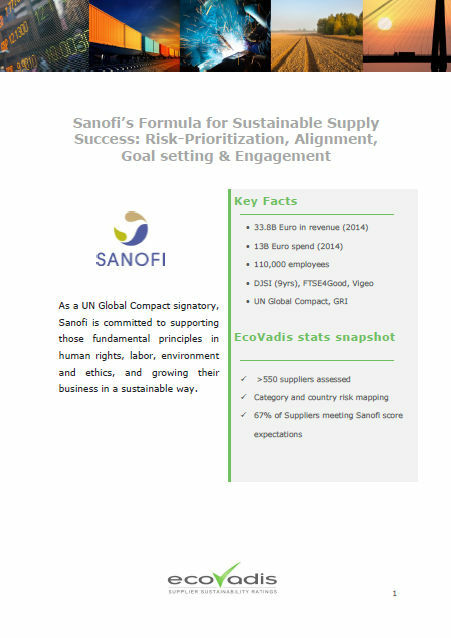 To make this approach more efficient for both Sanofi and our suppliers and to strengthen its integration into the Company’s risk-management and compliance processes, we made the choice of having a single and dedicated process based on CSR international standards. We have entrusted this mission to our external partner, ECOVADIS, in order to benefit from proven CSR expertise as it operates a web collaborative sustainability rating platform enabling us to get an evaluation of our suppliers’ CSR performances.